My worlds collide. I used to review the New York Times Book Review here every weekend, and then I got tired of the routine and decided to use the space instead to cover the philosophy beat (and review some of my own original ideas). But this weekend's Book Review is a philosophy issue, featuring three substantial articles and a cover illustration allegedly representing great thinkers like Plato, Kant, Descartes, Seneca, Augustine and Rousseau in some sort of faux-ancient diagram. I'm too curious to stay away -- let's dive in and see what we find. First up: Sarah Bakewell on a volume of philosopher mini-biographies, James Miller's Examined Lives: From Socrates to Nietzsche. It happens I just read a good new book by Sarah Bakewell called How To Live: Or A Life of Montaigne in One Question and Twenty Attempts at an Answer, which I hope to write more about soon. Today's article doesn't go down as smoothly as the book, though. Bakewell begins by justifying the rationale for studying the lives of philosophers along with their ideas (an easy sell, as far as I'm concerned), and then spins a few quick stories from the book. But the stories she cites focus more on the weird quirks of various great thinkers, rather than deeply considered appraisals of their entire lives. So we hear that Immanuel Kant "ended his life in an obsessive-compulsive hell, endlessly consulting thermometers and barometers" and that Diogenes the Cynic "lived in a clay jar, masturbated on the street and embraced snow-covered statues" (don't we all?). But these are sound bites, cocktail-party one-liners, banal anecdotes that only serve to caricature the great philosophers rather than helping us understand them as fully-realized people. Instead of catchy sound bites about great philosophers, I'd prefer mundane details of their everyday lives. Did they have children? Did they sustain long-term romantic relationships and close friendships? How did they earn a living? What difficult moral problems did they struggle with? I sense an excess of "cute" in Sarah Bakewell's examples from this book. I don't know if the "cute" comes from Miller's book or originates with Bakewell's review. But I may not be the only person who feels so uninspired by this rather bland article that we never bother to find out. In 2011, it’s disconcerting to read that we have been released from the ancient temptation to monotheism; much of the world hasn’t heard the news. Neiman is also harsh about the book's emphasis on the ecstatic behavior of crowds at sporting events or political events, objecting to a comparison of the audience mood at a football game with that at a Martin Luther King or Barack Obama speech. Strangely, her discussion of this problem leaves me intrigued to read more. Neiman doesn't mention that Friedrich Nietzsche's first major work The Birth of Tragedy also dealt with the ecstatic behavior of crowds, and even if Dreyfus and Kelly may approach the topic glibly, I'd rather read a work that ventures into the promising ground of social or relational philosophy then, say, yet another analysis of whether or not we have free will, or whether words have meaning. I hope to find the time to read Dreyfus and Kelly's book soon, and I'll be sure to tell you what I think. We're off to a bad start. It's obvious when a writer like Iris Murdoch denies the clear role of philosophical forethought in her own works that she's dissembling, and I would never take her quote at face value. To Myerson's credit, he raises this objection to Murdoch's quote himself (citing a response by Rebecca Newberger Goldstein). But if Murdoch's point is so flimsy, why begin the article with it? The question of whether or not a novel should be philosophical is, in my opinion, too boring to discuss. Yes, a novel should be philosophical. End of discussion. It's also typical of a certain highbrow disdain for Eastern philosophy that Ryerson's review lists Murdoch, Goldstein, Jean-Paul Sartre, William Gass, David Foster Wallace and several recent novelists who've managed to namecheck Ludwig Wittgenstein in the titles of their books, but ignores a significant philosophical trend in Beat and post-Beat fiction. Jack Kerouac's Dharma Bums, for instance, is about a gang of Berkeley hipsters grappling sweatily with Buddha's Four Noble Truths. It's hard to imagine a book more wholly philosophical than Dharma Bums. Robert Pirsig's Zen and the Art of Motorcycle Maintenance is not only about Zen (and motorcycle maintenance) but also about the narrator's cataclysmic confrontation with the canon of western philosophy at the University of Chicago. Based on its enduring popularity alone, this novel should have made this article's cut. 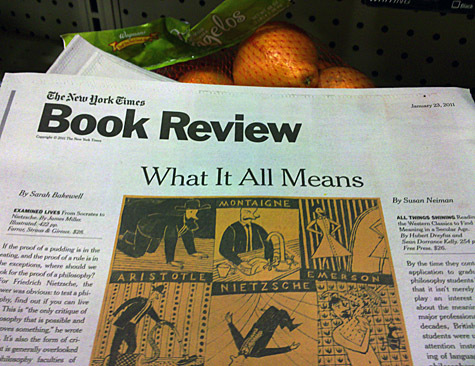 So how does the New York Times Book Review's first philosophy-theme issue hold together as a whole? It doesn't make as big an impression as I would have hoped. But I'm glad they gave it a try. Finally, since I still can't help reverting to my old habit of poking this publication on points of style: can it really be a good idea to allow the cliched phrase "warts and all" to appear twice in one issue of the Book Review? I should say even a single appearance of "warts and all" is one too many. This article is part of the series Philosophy Weekend. The next post in the series is Philosophy Weekend: The Innocence of a Crowd. The previous post in the series is Philosophy Weekend: The Collective Self. 1 Response to "Philosophy Weekend: Philosophy at the Book Review"
Amazing. Our suspicions are confirmed: The New York Times DOES read Literary Kicks! Good, intelligent review, Levi, although, as you probably know, I do not share your disinterest in weird quirks of the great thinkers.